No disposal specified. The decoder is not required to take any action. Do not dispose. The graphic is to be left in place. Restore to background color. The area used by the graphic must be restored to the background color. 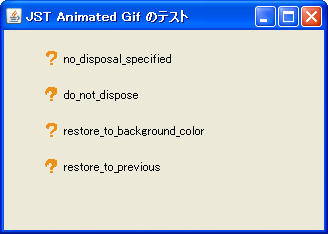 Restore to previous. The decoder is required to restore the area overwritten by the graphic with what was there prior to rendering the graphic.